Three years ago, German instrumental post rock band couldn’t convince the DisAgreement reviewer with their debut album. Maybe time stood still for the four-piece, but apart from a more sombre cover artwork, this feels exactly like their previous effort. Again there are twelve songs, although the total playing time is forty seconds shorter, and the song titles are weird and sometimes surrealist and/or dadaist, giving the whole thing a slightly pretentious ambience. 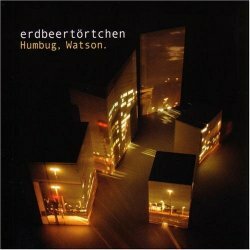 Once you start listening to Humbug, Watson., you are immersed into the Erdbeertörtchen’s harmless sonic universe consisting only of guitars, drum and bass, with not even a single song crossing the five minute border. These are actually instrumental pop songs, lacking the epic grandeur of more ambitious post rock bands, and while this CD is at no moment bad, it just sounds too much of the same throughout its three quarters of an hour, making for not exactly the most exciting listening experience. There are other reviewers around who see Erdbeertörtchen as post-kraut or as intelligent instrumental music. I don’t deny either claim (even though I would rather label them as Tortoise light), but there is just too little happening on Humbug, Watson. to make this an essential album. The analogue production at least sounds warm enough to get you through any winter night (too bad there’s a heat wave happening right now while I am writing this).